There is a moment which every tour guide must cherish, while leading culture-vultures and architecture geeks around Ludwig Mies van der Rohe’s modernist masterpiece, the Villa Tugendhat, in Brno. It comes after visitors have been ushered through the main entrance of this upside-down house (first the bedrooms, then the living areas), and admired its travertine marble flooring, its oversized, rare-wood doors, the bespoke bathroom fittings of the connecting en suite bedrooms, and the careful placement of exquisite, Mies designed furniture. That moment comes when you descend the stairs to the lower floor and enter the ‘glass room’ – a seamless living room, library and dining area with no walls across its 280 sq m floorplate, just a handful of slim, stainless steel pillars and floor-to-ceiling glass panels opening on to the landscaped garden and trees, and the medieval splendour of the Czech Republic’s second city of Brno beyond. There is, apparently without exception, a collective gasp, an intake of breath – that unique, percussive whoosh of air being simultaneously sucked in or exhaled at the sheer, unearthly beauty of this almost boundary-less glazed platform, suspended between the concrete basement floor and its airy upstairs sleeping quarters. The only dividing elements are a velvet curtain and a couple of screens: the slab of honey-coloured onyx that separates the living room from the library, and the glossy macassar ebony panels which curve around to frame the dining area. This kind of open-plan, clutter-free living has become a template for contemporary luxury homes. 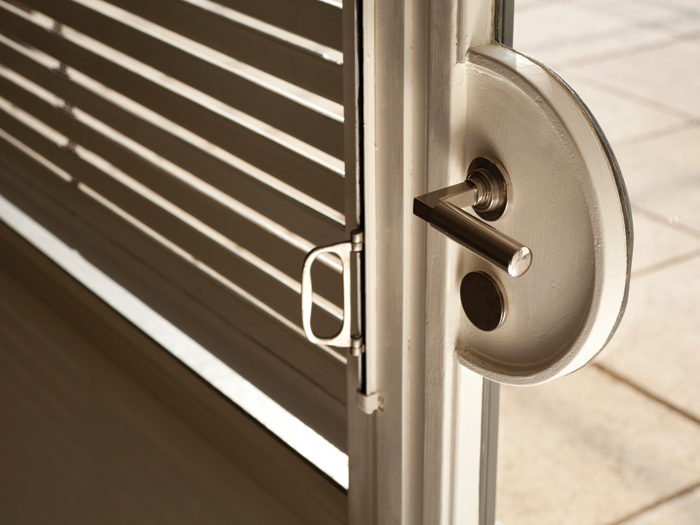 But it’s not the frame or plan of the building that impresses so much as the materials and the attention to detail that runs from the Mies-designed door handles through to the sinuous, cantilevered Tugendhat chair frames. 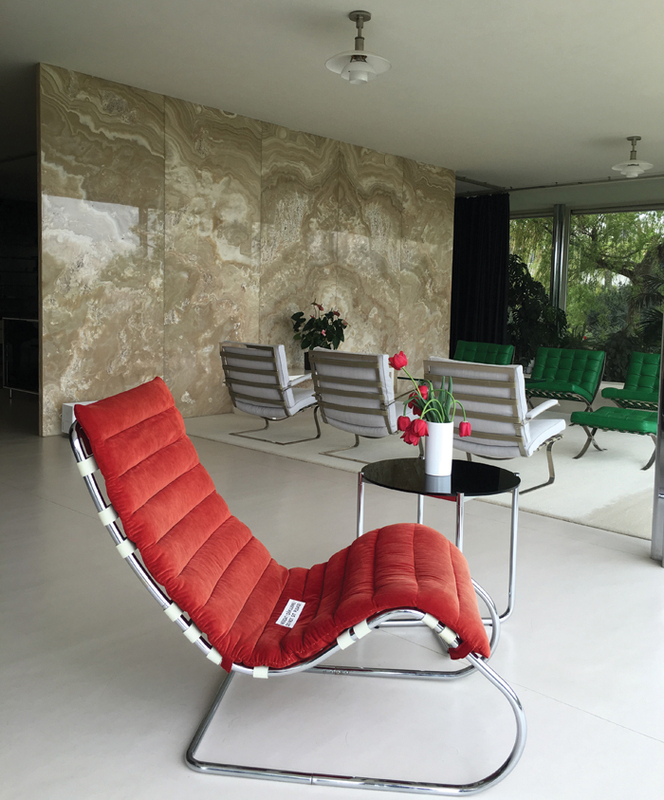 The continuity of line, the integrity of the materials and colours, are all as Mies and his interior designer, Lilly Reich, intended, adding up to the then progressive notion of the house as ‘gesamtkunstwerk’, a ‘total work of art’ created by Mies’s authorial vision. It’s very rare in any ordinary civilian’s life (barring the existence of any hedge-fund manager pals) that you enter a home as luxuriantly true to one overall aesthetic ideal as this, as loftily oblivious to the clutter and gadgets and budgetary constraints or compromises over taste that make most people's – even architects’ – homes more of a patchwork of the pragmatic and the liveable, enlivened by moments or materials that express loftier ergonomic or aesthetic ideals. 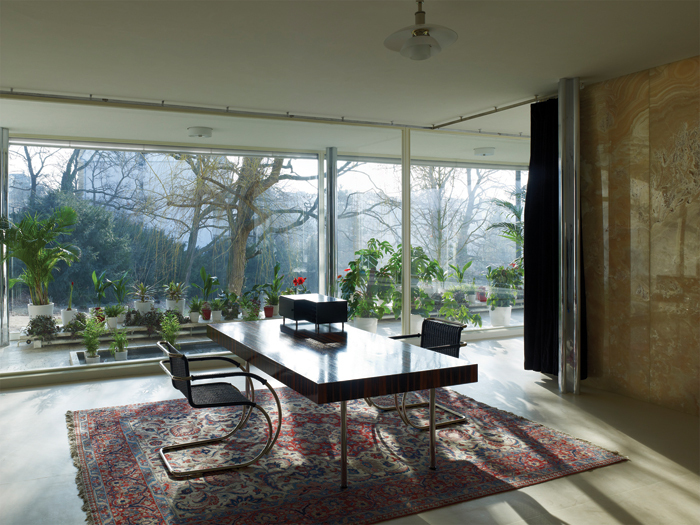 One of the reasons that Mies apparently accepted the commission to design this house for his wealthy, German-Jewish clients, Greta and Fritz Tugendhat, was the splendid position – high on a hill, overlooking the ancient city, and with ample gardens around it in which to set his gem. The second was the unlimited budget. As his wedding present to the couple, Greta’s industrialist father had set no limit on what the couple could spend on their dream home. So Mies was able to realise his vision of a house made of light and air, using the finest materials, and whose only ornamentation would be the most exquisite interior palette of marble, steel, bronze, stone, leather, velvet, rare wood and glass, with just the necessary touch of concrete. Villa Tugendhat was the kind of commission most architects and designers still dream about – budgetary and creative carte blanche. And it strikes me that such houses (now part of the Iconic Houses network (iconichouses.org, an international portfolio of the 20th century’s finest, most architecturally significant houses and artists' homes and studios) could surely be the most powerful tool for persuading clients to take risks, to think big, or buy in to their boldest visions. I remember many discussions with architects only 10 years ago over significant public projects – back in the day when visionary schools and healthcare buildings were still being commissioned and funded by the UK government – where they were constantly frustrated by the knowledge that, whatever they had done architecturally to create a genuinely uplifting, connective and humane space, it would inevitably be compromised by hideously ill-matched, cheap catalogue contract furnishings and fittings, killing the desired mood of humanitarian idealism at one institutional, health-and-safety-driven swoop. It’s only through the presence of exemplary buildings where a holistic vision informs both architecture and interiors, that change, however slow, has arisen. So that now we occasionally see major NHS buildings trying to emulate the sensitivity of a Maggie’s Centre. It’s amazing how current, even cutting-edge, Villa Tugendhat feels, 85 years after it was completed; the ideas that made it bold then are still prevalent – and still rarely executed to this standard. It was the first domestic residence to use steel frame, glass and concrete construction, previously typical of factories. It was pioneering in its use of space: a layout designed to enhance the family’s daily life, including the private roof terrace that can be accessed by everyone directly from their bedrooms; that sense of connectivity between indoors and out. Perhaps, most importantly, the house communicates the role of craftsmanship and quality of materials and finish in transforming what could be a cold and mechanical structure into something enchanting and sensual. Mies may have given birth to the much-abused axiom ‘less is more’, but it’s clear that only through craftsmanship and quality can you bring grace to such a stripped-back space. The tragedy is that the Tugendhats only lived in the house for eight years, being forced to flee the invading German army in 1938. Thankfully, after decades of neglect and abuse, the designation of the building as a UNESCO world Heritage Site in 2001 meant the Czech government could apply for sufficient European funds to complete a thorough and appropriate restoration. Under the careful stewardship of Brno-based design firm Omnia Projekt, the two-year, 2,800 sq m project completed in 2012, at an estimated cost of €5.8m. As a grateful visitor, enriched by the extraordinary experience of inhabiting – even for an hour – what felt like a ‘total work of art', I would say that was money well spent. I can only hope that the benefits of its exemplary execution will ripple out to the architecture and design professions for years to come.